Kids’ parties are known to be noisy, crazy and rowdy – but they don’t have to be stressful for parents. Whether the party is being held at your home or somewhere else, you can minimise the effort and maximise the fun. Here are some ideas for throwing a birthday party for your child, minus the stress. While it’s necessary to feed the party guests, you can keep the effort required to do this to a minimum with some good timing. Lunchtime parties require lots of catering, but if you keep the party to morning tea or afternoon tea times you can get away with offering a few simple snacks. These can be as basic as you like – things like chips, popcorn, sausage rolls, fruit platters and, of course, cake are always a hit. Most of all, remember that the kids are happy to be there sharing the fun and food with their friends, and they don’t expect elaborate catering. On the subject of timing, it’s also a good idea to write an end time on the party invitations. Depending on the age of your child, about two hours is a good length of time for a group of young children to have some fun and finish up before overtiredness kicks in. From food and cake (yes, it’s okay to buy one instead of slaving away for hours) to entertainment, it’s time to embrace the fact that kids love simplicity. A couple of uncomplicated games will keep the children happy and, let’s face it, they want some unstructured time to run around at the party as well. 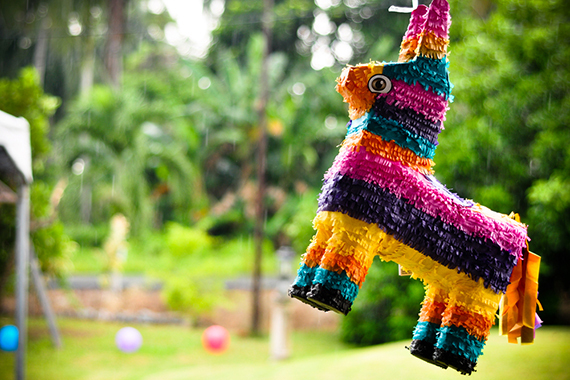 Easy games that make kids feel they’ve hit the party jackpot, without elevating your stress levels, can include pass the parcel, musical statues, a teddy bear’s picnic, bobbing for apples or a piñata. You don’t have to do it all – call in some help to spread the workload. Whether it’s your partner, a good friend, another parent or two, or your child (if they’re old enough), ask for some help setting up, packing up and organising things during the party itself. Outsourcing some elements can also help to ease the effort. Consider the things you can do well and that you won’t find too stressful, and what you’d feel more comfortable asking for assistance with. That might be the cake, some entertainment or even the whole party at a location away from home to save cleaning up afterwards. When in doubt, put it on a to-do list. This is the key to staying calm when throwing a kids’ birthday party. Write a list of everything that needs to be done, delegate each item to a member of the family, and get cracking. There are lots of items that can be ticked off well ahead of time, including buying all the snacks and cake ingredients, getting the invitations sorted, creating the loot bags, and more. And when all is said and done – enjoy!